Effective customer relationship management is the key to continued support and attendance, which many times results in huge economic benefits. Safety and security concerns are not unique to the United States. Countries across all continents have created, developed, and maintained safety and security organizations, policies, and procedures to address security issues and enhance the safety of their citizens. Sport and event organizations should conduct exercises to test plans and promote awareness of staff roles and responsibilities during an incident scenario. Security Management for Sports and Special Events supports the planning, implementation, and communication of security and emergency plans to staff and game-day hires, as well as the assessment of emergency preparation. Though spectator and player security has always been a priority for sport and facility managers at all levels, large-scale threats such as terrorism or natural disasters have become even more critical management concerns. Proactive sport and facility managers understand the role they must take in working with local law enforcement, contracted security personnel, and their own employees to adequately plan for and respond to threats—both manmade and natural. Security Management for Sports and Special Events: An Interagency Approach to Creating Safe Facilities presents a systematic approach to stadium and venue security. Unlike traditional risk management books that present guidelines to promote safety and discourage litigation in sport and recreation settings, Security Management for Sports and Special Events deals specifically with natural disasters, terrorism, crowd control problems, and other large-scale threats. As sport and facility managers seek to broaden their building management capabilities, this text offers detailed guidance in improving the quality, coordination, and responsiveness of security protocols within their facilities. With this text, sport and facility managers examine the concerns and challenges to security and emergency planning for both sport and non-sport events held at their facilities. Security Management for Sports and Special Events offers an organized explanation of event security to support the planning, implementation, and communication of security and emergency plans to staff and game-day hires as well as the assessment of emergency preparation. Drawing on numerous examples from both in and out of sport, readers will consider the challenges, solutions, best practices, and prescriptions for coordinating the efforts of staff, law enforcement, and security personnel. Emphasizing interagency development and a team approach to sport event security management, Security Management for Sports and Special Events allows sport and facility managers to lessen risk, control insurance costs, and uphold the integrity of their facilities through security management procedures. 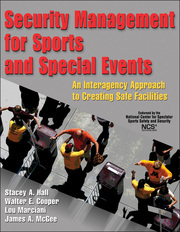 The text is developed according to the requirements of the Department of Homeland Security’s National Incident Management System (NIMS) and serves as the manual for managers seeking to achieve the SESA Seal of Approval offered by the University of Southern Mississippi’s National Center for Spectator Sports Safety and Security (NCS4). Developed by the authors and the only dedicated research facility for sport security management, NCS4 is on the cutting edge of researching and assessing game-day operations for security and crisis management. Security Management for Sports and Special Events is a practical resource for identifying and managing potential threats to fans’ and players’ safety. With proper protocols in place and a coordinated response, sport and facility professionals can ensure the safety of participants and spectators from terrorism, natural disasters, and other potential encounters. A reference for sport administrators, facility and event managers, league and organization officials, and security-related contract or volunteer personnel. A textbook for graduate students taking courses in sport event and sport facility management, risk management, or sport law. Stacey A. Hall, PhD, is associate director of the National Center for Spectator Sports Safety and Security (NCS4) and an assistant professor of sport management at the University of Southern Mississippi (USM), where she developed a graduate-level emphasis in sport security management for the master's program. Hall's research on sport safety and security has been published in many journals on sport management, homeland security, and emergency management, and she has coauthored a textbook on global sport facility operations management. Hall has presented at international and national conferences and conducted invited presentations for U.S. federal and state agencies, college athletic conferences, and professional sport leagues, including Major League Soccer (MLS). She was also invited as a contributing expert in sport security to the first international sport security conference in Doha, Qatar, in 2011. Hall has been the principal investigator on various external grant awards from the U.S. Department of Homeland Security in order to develop risk management curriculum for sport security personnel at NCAA institutions, conduct risk assessments at college sport stadia, and develop training programs for sport venue staff. She has also been involved in several service projects, including development of a risk assessment tool for U.S. sport stadia in conjunction with the Department of Homeland Security and International Association of Assembly Managers and development of a disaster mitigation plan post-Katrina for the Mississippi Regional Housing Authority. Hall has completed training in assessment of threat and risk through the National Emergency Response and Rescue Training Center, training in terrorist bombing through New Mexico Tech Energetic Materials and Testing Center, and training in contingency planning of special events for public safety agencies through the FEMA Emergency Management Institute. A competitive soccer player, Hall was team captain for the Northern Ireland international soccer team. She retired in 2008. Hall now resides in Hattiesburg, Mississippi. Walter E. Cooper, EdD, is professor emeritus and director of training at the University of Southern Mississippi’s National Center for Spectator Sport Safety and Security (NCS4). He holds certifications and has completed training in incident response to terrorist bombings, prevention and response to suicide bombing incidents, and incident response to campus bombing incidents (New Mexico Tech University); prevention, detection, and response to campus emergencies (NCBRT-Louisiana State University); enhanced threat and risk assessment (TEEX-Texas A&M University); and risk assessment methodology for chemical facilities (Sandia National Labs RAM-CFTM). His research on emergency management and risk facilitator management for sporting events has most recently been published in the Journal of Emergency Management and the Anser Homeland Security Institute: Journal of HomelandSecurity. Cooper presents frequently on issues of emergency training within school environments at all levels (K-12 and collegiate). Lou Marciani, EdD, is the director of the National Center for Spectator Sports Safety and Security (NCS4) at the University of Southern Mississippi. The NCS4 was founded with initial funding from the Mississippi Office of Homeland Security as the country’s first academic center dedicated to spectator sports safety and security research, professional development, enhanced training, and outreach. At the NCS4, Marciani works with professional sport leagues, the NCAA, national collegiate directors of athletics, the private sector, and government agencies in enhancing sport safety and security. Marciani is the principal investigator for research funded by grants through the Office of Homeland Security and U.S. Department of Education. His work at NCS4 focuses on the development and implementation of a sport risk management curriculum as well as a decision support system for sport venues to include simulation modeling for stadium evacuations. Marciani’s extensive career in sport management includes serving as intercollegiate athletic director at several universities and as executive director of two national sport governing bodies. He is an active speaker on sport safety and security at international and national sport organization annual conferences. Marciani also serves as a resource for the U.S. Office of Homeland Security on sport safety and security issues. James A. McGee, MS, has 25 combined years of law enforcement experience and 21 years as a special agent with the Federal Bureau of Investigation (FBI). McGee is currently a senior consultant at the National Center for Spectator Sports Safety and Security (NCS4) and an adjunct professor in Department of Homeland Security studies at Tulane University in New Orleans, Louisiana. McGee teaches security and terrorism courses both at the university level and internationally. He is regarded as an expert in security measures associated with venues of mass gatherings, and he lectures frequently on this topic. As an FBI special agent, McGee spent 16 years working in security management for sporting events, including several Super Bowls and the 2004 Olympic Games. During his tenure he was the FBI supervisory special agent for the New Orleans Division Joint Terrorism Task Force and the FBI security coordinator for the 2004 Summer Olympic Games in Athens, Greece. In addition to his extensive field experience, McGee holds a master of science degree in criminal justice from Virginia Commonwealth University in Richmond, Virginia. As a Department of State Anti-Terrorism Assistance instructor, he teaches courses in major events security management and critical incident management. McGee is also the global security consultant for ESPN, providing corporate security consultation and surveillance operations for major sporting events such as Monday Night Football, Sports Nation, and College Game Day. In 2010, McGee received an Independent Publisher’s Book Award for his true crime book Phase Line Green: The FCITalladega Hostage Rescue. In his free time, McGee enjoys spending time with his family, fitness training, and writing. He and his wife, Shawna, reside in Pass Christian, Mississippi.